It's official, we are thrilled to announce ekoparty in Los Angeles! Ekoparty LA is the first international expansion for Ekoparty, produced in partnership with Supermassive, bringing the expertise and culture of this vibrant and disruptive conference from its home in Buenos Aires, Argentina to North America for the first time. We anticipate attendance of 800+ cyber-security specialists. A new edition of ekoparty arrives and returns the classic competition of Slogans, where some of those who won previous editions were really witty like "Back to roots", in a play on words that evokes the beloved film Back to the Future, or "Hold the backdoor" in reference to the popular television series Game of Thrones. Do you have ideas for a good slogan for this year? - Will it look nice on the home page of www.ekoparty.org? - Would I like to wear a T-shirt that says that? - Is it suitable for all audiences? - Does it represent ekoparty culture? ekoparty security conference 2018 Call for Papers is Open! We are really proud to announce the fourteen edition of the Ekoparty Security Conference. Once again, in this unique event, security specialist from all over Latin America and the World will have the chance to get acquainted with the most important researches of the year. Ekoparty has become the most important technical conference in Latin America, which keeps offering the deepest knowledges in the field. 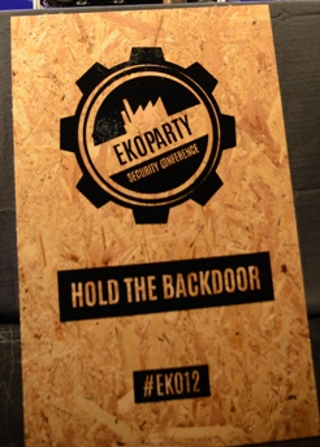 In this year's edition of ekoparty, we are expecting to bring together more than 3000 security specialists. During the 3-day high voltage lectures, you also can enjoy activities like our famous LOCKPICKING VILLAGE, the WIFI ATTACK LABORATORY, a WARDRIVING around the City, free WORKSHOPS, the most important CAPTURE THE FLAG in Latin America, not forgetting of course, our amazing parties! * ekoparty will recognize the trajectory of Latin American researchers, as also their greatest researches. Stay tuned! The ekoparty organization team is kindly inviting anyone who is interested in showing and sharing his researches and/or developments in the field of Information Security. * All the lectures are going to be simultaneously translated breaking any language barrier. Consideration will be given first to ORIGINAL work and content that has not been duplicated at any other security or networking conference prior to September 1st, 2018. Submissions with technical papers attached will be given preference. * Speakers including a Hands-on Workshop proposal earn extra points in the CFP. Robots are gaining more and more privileged places within our society, first in the big factories and now increasingly in the public space or in a surgery room. This means that where there is software and hardware, there are potential vulnerabilities to exploit, which in the case of robots no longer serve only to manipulate a digital system, but can provide the attacker access to the robot arms to act on the physical world and, consequently, against humans. In this talk by Cesar Cerrudo and Lucas Apa, computer security researchers with a long history searching for vulnerabilities and investigating technologies, will bring us closer to the real world of the danger of robot hacking, showing what methodologies can be used, and what consequences they can bring to society , all in order to push for a future with safer robot designs in which this type of vulnerabilities can be prevented from being exploited. In 2016 Sheila Berta and Claudio Caracciolo told us how the CAN bus worked in cars and how it was possible to exploit it after an extensive investigation that they did. To prove it, they made a rudimentary backdoor of hardware that connected to a car allowed them to perform some actions by SMS. Now in their new talk invite us to listen to their new discoveries and see their new developments, this time the backdoor is named, The Bicho, and allows a wide range of applications. Have you ever imagined the possibility that your car is automatically attacked based on its GPS coordinates, its current speed or any other set of parameters? The Bicho promises to live up to all these questions. The alarms of the cars are not without being investigated, and it is there where Leandro Ferrari put the eye, and brings us a presentation on how despite implementing certain levels of safety, the alarms for cars have some possible vectors of attack including taking less than 5 samples of the analog control signal. The conclusions will be demonstrated in this talk in conjunction with explanations about possible scenarios of attack in real life and its consequences, showing that the companies still have work to do in improving the security of this type of devices. The old and beloved IEEE 802.11 standard over the years was adding different versions and extensions that provide new functionalities and complicate the protocol. To make matters worse today, modern devices support specifications such as Cisco Client Extensions, WiFi Protected Setup, WiFi Direct, AirPlay and AirDrop, among others. A bad implementation of these technologies opens the way to possible attackers. In this talk the independent researcher Andrés Blanco will show us how an attacker can make use of these specifications to dial devices and obtain information from the internal network without even being connected to it. Being a TOR exit node can get you in trouble? Apparently in Argentina was the case, but with some particularities. Hackan was an exit node of TOR, and from its node a banned image was posted on the 4chan network in 2013. On 15/6/2015, the complaint was filed in Argentina, coincided with the same day that the voting elections in the City and Buenos Aires. HackanCuba (Iván Barrera Oro) is recognized for conducting conferences and practices for years to demonstrate the different vulnerabilities of the electronic voting system used. One week before that complaint, the police had raided Joaquin Sorianello, another researcher who was working on the subject of the Electronic Vote in Argentina, generating a clear persecution against those who are against the system used. This story will be followed in depth by Rodrigo Iglesias, Electronic Technician - Lawyer - Specialist in Computer Crime, and Ivan Barrera Oro, a passionate about electronics and computers that was seen under this complaint. Nicolás Rivero Corvalán, Engineer in Information Systems, Jorge Couchet, Master in Artificial Intelligence and Eduardo Casanovas, Electronic Engineer, will tell us about the Neighbor Discovery protocol and about communications at the data link level of the IPv6 protocol. They will work on the operation and security of the protocol, vectors of attack, and possible mitigation techniques. The Secure Neighbor Discovery protocol will be implemented and analyzed in a critical infrastructure scenario. To complete this analysis, we implemented Graphical Machine Learning techniques to detect changes in IPv6 message patterns and identify possible attacks. Every pentester knows that in his life there will come a labor in which he finds absolutely nothing, and will have to resort to the famous "grab the shovel" and enter the depths of "best practices" and "filler findings", for that it is always better to lose dignity than to deliver an empty report. As we contemplate the finitude of existence and the series of bad decisions that led us to this moment, we may encounter an "Insecure Randomness" and we stack it together with ClickJacking and old versions of TLS. But what would happen if with a basic knowledge of cryptography and mathematics, we could transform this cornucopia of guitarreadas to a critical one? In this turbo talk of security researcher and pentester Alejo Popovici will take us in a tour-de-force on the pseudo random generator of Java and a specific implementation of apache.commons that will allow to obtain the seed and predict future results, with drastic consequences for the applications that use it. This is all for now, and soon we will be leaving more synopsis of the talks that will be available at the Ekoparty Security Conference 2017. - The competition can be played by individuals or groups, only one account per team. - You may not be elegible to claim the prize if you are an employee or contractor of EKOPARTY or any of its affiliates. - The participant must provide a real point of contact for future notifications or claim the prize. - Share solutions or hints. - Attack computers or applications not designated by the competition. - General bruteforce attacks over online platform. - Other things we consider to be unfair. without those kind of tools. Participants are ranked by score and speed. Score is dynamically defined. Meet us on irc.freenode.net ##ekoctf and #ekoparty if you have any question, suggestion, or found a bug in the competition. EKOLABS 2017 - Call for Tools is Open! As you know the concept is very simple, the EKOLABS tool area is dedicated for independent researchers and the open source community. We will provide kiosks complete with monitor, power, and wired Internet access and you will bring your machine to showcase your work and answer questions from delegates attending ekoparty security conference. 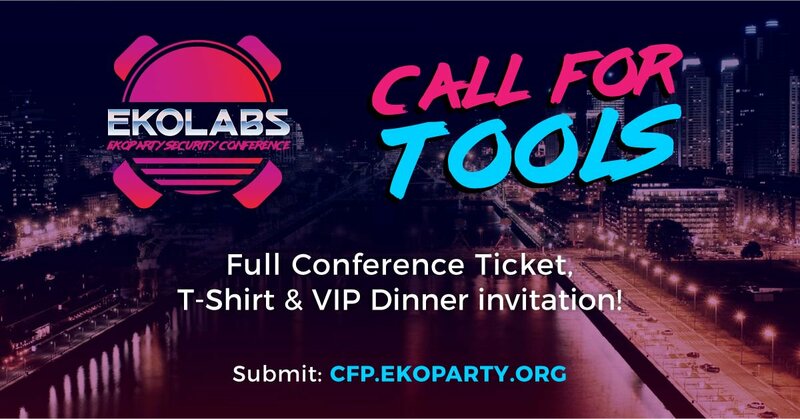 It is with great pleasure that we announce the launch of the Call for Tool for this edition of EKOLABS held at the Ekoparty 2017. As speaker you will have one (1) full ticket for the conference. EKOPARTY won’t pay your accommodation and flights for the conference. If you think you can survive these rules and want to give your tool a chance to shine, the time is now! Applications for EKOLABS will be accepted until Saturday 9, September 2017, with rolling acceptances until that date. Vote in the Slogan Contest for #Eko13 and help choose the winner! You can now vote the slogans to choose the winner, last year for #eko12 won the phrase "Hold the backdoor". To participate send your proposal by email to slogan13@ekoparty.org with subject slogan13. Once the proposal submission phase is completed, online voting will begin. ekoparty: Call for Papers 2017! Open! We are really proud to announce the thirteenth edition of the Ekoparty Security Conference. Consideration will be given first to ORIGINAL work and content that has not been duplicated at any other security or networking conference prior to September 1st, 2017. Submissions with technical papers attached will be given preference. We just finished uploading all the eko12 talks, they are online and ready for you!